On Monday, representatives from UCH unions addressed the UCH Board of Directors and urged them to support keeping UCH a public hospital. President Kevin Claffey, Dr. Laks, and Dr. Audrey Chapman, Ph.D. spoke on behalf of UCHC-AAUP. Please click here for text. Everyone did an excellent job and thank you for making your way to the meeting in spite of the storm! Tomorrow is the State Appropriations Committee hearing at 5:30pm. Please let us know if you can attend or send in testimony. Our suggestion for the content of testimony is that it argue in support of funding our public hospital. The content could focus on the care we provide to the public, our research and educational efforts for the public good. We also want to support legislative relief for the high unfunded liability fringe cost, specifically as it relates to research. All are welcome as we are trying to have a good showing. It will also be a great opportunity for us to meet with our lobbyist to discuss legislative happenings. 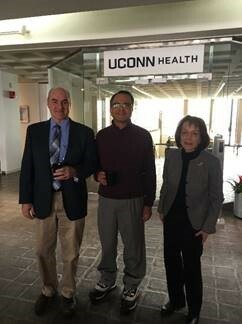 On Feb. 21, UCH scientists testified at the Higher Ed Committee seeking relief from the high costs of the unfunded pension liability passed on to research grants. Scientists also submitted testimony online. If you’d like to see the testimony, please click here. Thank you to everyone who provided testimony! If you are not currently a member of UCHC-AAUP, we encourage you to join our advocacy organization. Please click here for a membership form. Chapman after speaking with BOD on Monday. Let’s stand together in the face of a possible national ‘right to work’ decision by the Supreme Court! Last week I was in London to participate in a scientific symposium. During coffee breaks, many British colleagues asked me and other American visitors to explain the bewildering news that President Trump had announced his intention to cut the budget for the National Institutes of Health by 18.3 percent, about $5.8 billion. Anti-worker politicians in the Connecticut legislature are trying to silence the voices of teachers, firefighters and all public employees and strip their rights to negotiate a better future. A proposed bill would roll-back the ability to collectively bargain over pensions or medical insurance, stealing working families’ access to affordable care or retirement security. WHEN: Tuesday, February 21 beginning at 2:00PM (the hearing will run into the evening, so come when you can). WHERE: The Legislative Office Building, located next to the State Capitol in Hartford at 300 Capitol Avenue (free parking is available in the adjacent garage). Gov. Dannel P. Malloy has cultivated a national reputation as a passionate progressive on social issues. From transgender rights and immigration to abortion and criminal justice policy, he has been an enthusiastic ambassador for the Democratic party’s liberal wing – and a vocal opponent of President Trump’s agenda. NEW BRITAIN, CT — Gov. Dannel P. Malloy offered a preview Monday of what municipalities and school districts can expect when it comes education aid. HARTFORD, CT—Republican legislative leaders added a lot of uncertainty to the fate of a deal to restructure the financing of state employee pensions Wednesday when they released their own plan mid-afternoon.